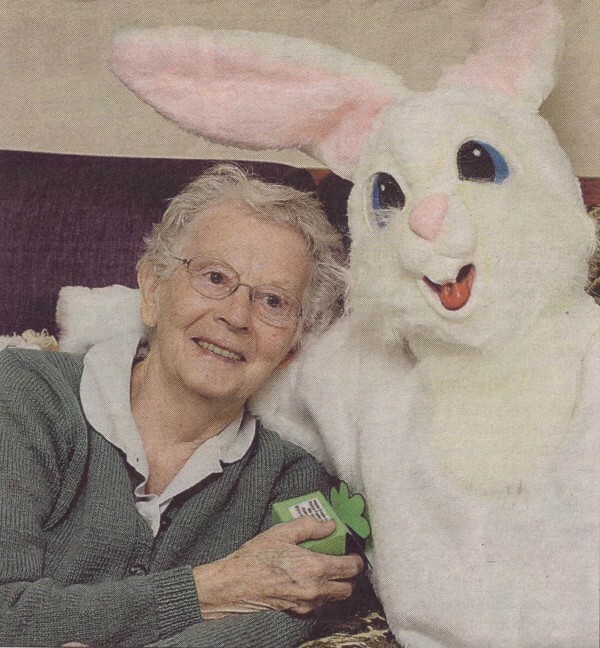 ) Up close: Margaret Miller snuggles up to Easter bunny at Rodney Park Village's Waratah Lodge on Wednesday.
) 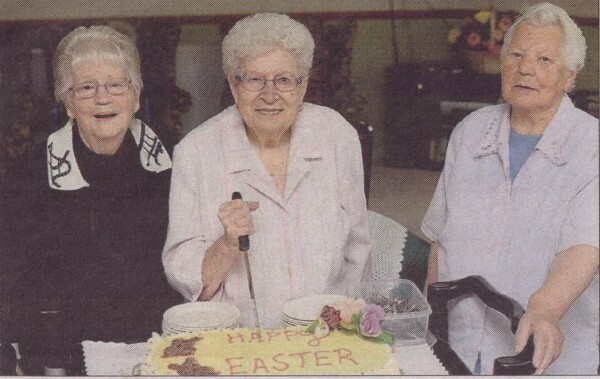 Celebrating: Judy McGuire, Aileen O'Connor and Ann Klaver prepare to cut the Easter celebration cake at Waratah Lodge. Treat: Waratah Lodge resident Aileen O'Connor is happy with her treat from Easter bunny. Great friends: Easter bunny is just as delighted to meet Sylvia Topp as she is to meet him. A special large white fluffy guest helped a group of Mooroopna residents start Easter celebrations on Wednesday. Easter bunny surprised Rodney Park Village's Waratah Lodge residents with a visit, handing out special decorated baskets filled with chocolate treats - and lots of hugs. Rodney Park Village activities and lifestyle officer Muna Riches said different activities were planned to brighten residents' days. "Every special occasion - Mother's Day, Father's Day, Valentine's Day - we try to do some kind of special celebration and activity for the residents," she said. "I think they really enjoyed it and it was good to see them have a laugh and participate in activities." Ms Riches said the activities also helped them to get involved with other people at Waratah Lodge. "It enriches their lives when there are activities - some of them aren't able to get out, so they love going to activities in their own home," she said. A special Easter cake was whipped up by the Shepparton Villages catering department and residents enjoyed a themed morning tea.